You can now purchase the DIY Kit directly from us. If you would prefer to have the ezChill professionally installed there are people who can provide that service for you. Our partner site, Fix My PC Doctor, provides two levels of service. 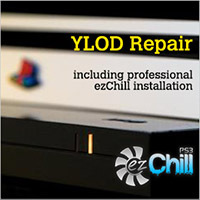 A simple ezChill installation, and a complete YLOD repair service with ezChill installation. If you’re console has already met it’s maker, you’ll need that latter service to get it back working again. If your console is still working, but you want the security and piece of mind that the ezChill offers, you can go for the simple installation. Your console will get a free check-up at the same time. ezChill installation is also available at some local repair stores and other online businesses. We’ll try to add more options as they become available. © 2013 - All Rights Reserved - PS3ezChill.com.